The Power Purge Sr systems are the quickest ways to bleed a SeaStar® or BayStar® system and assure a rock-solid steering feel every time! Power Purge systems reduce installation and warranty costs while enhancing the quality of the boat for the end user. A typical manual fill and purge takes the average, experienced installer about 30 minutes per boat — by using Power Purge this can be reduced to 10 minutes or less. 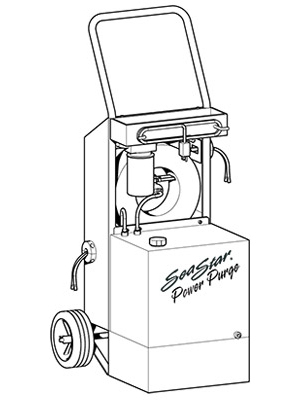 Power Purge Sr and Power Purge, Jr. are available to any business at which SeaStar® is installed by qualified marine hydraulic steering technicians. • Increased quality of system purge for solid, responsive steering feel.